French officials say the cousin of the presumed ringleader of last week's Paris attacks did not blow herself up in a police raid as previously thought. 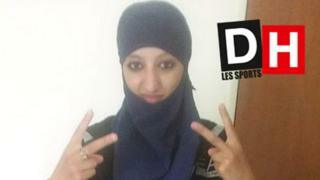 They say the suicide bomber was a man, not Hasna Ait Boulahcen, who also died in Wednesday's raid in Saint-Denis. Her cousin, alleged ringleader Abdelhamid Abaaoud was also killed. A third body was also found. Meanwhile, the UN Security Council adopted a resolution to "redouble" action against Islamic State. The unanimously backed resolution - which was drafted by France - also called on members to "take all necessary measures" and co-ordinate efforts in the fight against IS, which claimed responsibility for the 13 November attacks in Paris. In a separate development, French prosecutors said that a second suicide bomber from the Stade de France attack passed through Greece on his way to France. The prosecutors had previously said one of the other attackers had come on the same route, via the Greek island of Leros. The men may have been posing as Syrian refugees. Meanwhile, Belgian authorities announced that a suspect had been charged with involvement in the attacks, bringing the number of people charged there to three. France's Prime Minister Manuel Valls announced that the death toll from the attacks a week ago by suicide bombers and gunmen had risen to 130 people. Hundreds of people were wounded in the near-simultaneous attacks on Paris bars and restaurants, a concert hall and sports stadium. Islamic State (IS) said it was behind the attacks - the worst in Europe since the 2004 Madrid bombings. Demonstrations have been banned under France's state of emergency, but dozens of French artists and cultural figures have urged people to make a lot of "noise and light", by turning on music and lights, at 21:20 (20:20 GMT) on Friday to mark the exact time a week ago that the attacks began. People have gathered at the sites of the attacks to commemorate the victims, as well as the Place de la Republique square, which is close to some of the bars and restaurants that were attacked and has become a focal point of remembrance. Who was Hasna Ait Boulahcen? In an exclusive interview with the BBC, a member of the police assault team involved in Wednesday's raid said Hasna Ait Boulahcen, 26, was "trying to say she was not linked to the terrorists, that she had nothing to do with them and wanted to surrender". But he said that due to prior intelligence, "we knew that she was trying to manipulate us". Prosecutors confirmed that both she and Abbaoud died in the seven-hour-long raid in the Rue Cormillon apartment on Wednesday morning. News that Abaaoud - a well-known face of IS and on international "most wanted" lists - and at least one of his accomplices may have travelled undetected from Syria before carrying out the attacks has raised fears about EU border security. Media captionA relative of Salah Abdeslam: "We really hope he surrenders before the police kill him"
EU ministers decided on Friday to tighten checks on all people entering Europe. At present only non-EU nationals and migrants are systematically checked by police at the EU's external borders. But now the EU will extend those database checks to EU citizens too. Travellers' details will be checked against data in the Schengen Information System (SIS), which lists wanted terror suspects and people linked to organised crime. Most EU countries are in the Schengen zone - a passport-free travel area. After the Paris attacks it emerged that terror suspects had not been detected at the EU's external borders. The European Commission has called for the establishment of a Europe-wide intelligence agency. In Brussels, France's Interior Minister Bernard Cazeneuve said he and fellow EU ministers agreed on tightening security over firearms and collecting data on people flying to and from EU countries. Germany's Interior Minister Thomas de Maiziere said Europe must exchange information on the gun trade. "We can only fight terrorism with a better information exchange," he said. In a stark warning of the dangers facing Europe, Germany's head of domestic intelligence, Hans-Georg Maassen, told the BBC that IS was "starting a terrorist world war". He also said he was concerned that Islamist extremists could recruit refugees from Syria, now housed in camps in Germany and other parts of Europe, who may have been trained in the use of weapons during four years of civil war. IS is a notoriously violent Islamist group which controls large parts of Syria and Iraq. It has declared its territory a caliphate - a state governed in accordance with Islamic law - under its leader Abu Bakr al-Baghdadi. IS demands allegiance from all Muslims, rejects national borders and seeks to expand its territory. It follows its own extreme version of Sunni Islam and regards non-believers as deserving of death. IS projects a powerful image, partly through propaganda and sheer brutality, and is the world's richest insurgent group. It has about 30,000 fighters but is facing daily bombing by a US-led multi-national coalition, which has vowed to destroy it.